One problem with well crafted story arcs is that time must occasionally be sacrificed for positioning, posturing and introducing elements that become a big factor later. Pieces move into position and early ripples form that will make huge waves down the road, but there isn't much accomplished. A major mover that is not the first to come to mind- Myotismon himself. Fed up with the failure of minions like Demidevimon and Raremon, he packs up and ferries himself into town to have better feel for how the operation is proceeding. The move is overshadowed by events later in the episode, but this is a big deal. Having the big guy in town makes the situation all the more foreboding and while nobody picks up on the cause, the symptoms are seen all over the place. The show has done a good job of regularly cutting to newscasts covering the incidents. Earlier, the attacks were written off as hallucinations or delusions. Now, the level of destruction Raremon caused makes the reality undeniable. Furthermore, Myotismon's penchant for late night snacking on the blood of young women is making headlines. It's attributed to a rise in anemia cases, but even that has reporters on edge. Finally, the thick fog that spreads in Odaiba upon Myotismon's arrival gives everybody the willies. The media is growing convinced that something weird is going on, and that this is just the beginning. 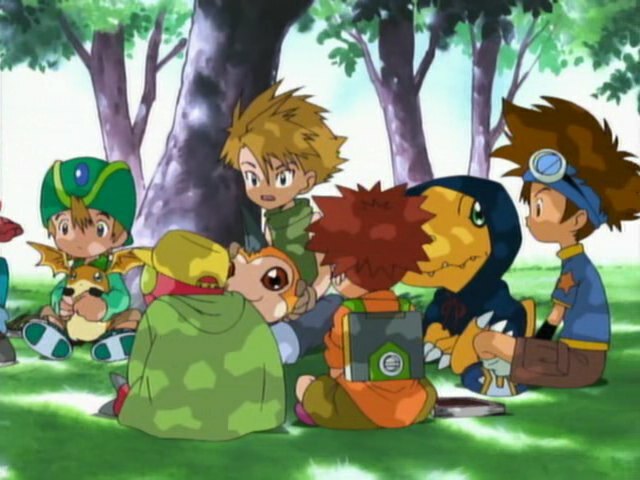 In the meantime, the digidestined, after a good night's sleep (for six of them at least), gather in the park to share contact information about all the kids they knew from Highton View Terrace. While Tai catches flak for losing his address book, I'm actually quite surprised everybody else still had theirs... and that kids keep such comprehensive address books that they would be useful in tracking down the eighth child. Since Joe doesn't want to track the eighth child on foot due to homework (the dub cracks jokes about him having homework in the summer, but that's commonplace in Japan), he gets saddled with the job of contacting everybody while the rest of the team goes hunting. 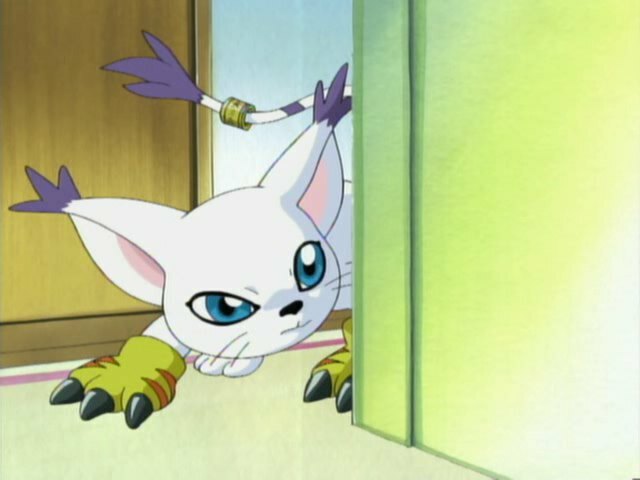 Speaking of hunting, Gatomon's on the prowl as well and happens to cross paths with Kari, who recognizes her as a Digimon and asks her if she is one. Oops! Gatomon plays dumb kitty, but follows Kari home. Kari invites her inside and is about as gracious a host one can be while being distracted by the television. Gatomon's taken by the kindness, but figures she better take care of her just in case. 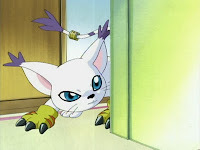 That's the frightening thing: Gatomon is poised to kill Kari even with no absolute proof that she is the eighth child. She made a passing reference to Agumon (there was no evidence that the eighth child is aware of Digimon), but the fake crest did not glow, so there's nothing definitive here. Gatomon's got a hunch, and that's good enough for murder. And if she did do the deed, the loose digivice would surely respond eventually and Myotismon's search would continue. Kinda dark for a kid's show. 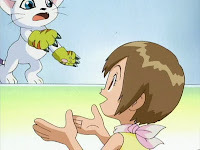 Then again, the image of Gatomon ready to slice Kari's neck open is extremely dark for a kid's show, and that's not even subtle. Kari's charm throws Gatomon off enough to cause a retreat, so no eight-year-old girls get murdered today. The bulk of the action is at Tokyo Tower (the anime action magnet of Japan! ), where Sora and Mimi run afowl of the SkullMeramon that Joe and Izzy narrowly avoided two episodes ago. It's a nice battle with some interesting choreography. The tower sustains a fair bit of damage and this too makes the news, but that happens all the time in Japan and the newscasters shouldn't find it weird at all. And so begins the attempt to disguise the Digimon by dressing them in trenchcoats and other conspicuous clothing. Sadly, the best disguise effort was Mimi's, and that only required a ten year old to push a baby stroller around the city. On the train, the kids make a point to note the damage Raremon caused and recognize that the Digimon are causing actual destruction to the city. It's an important note, and one of the underlying messages of the episode... but wasn't that apparent to them right away in the Mammothmon battle? Demidevimon and Gatomon have such delightful bickering. While his shtick has gotten well worn by now, he has such great nicknames for everybody. Gatomon gets three in one scene- Whiskers, Puss 'n Boots and Kitty Litter. Yes, we got irritating whiny Mimi this episode, but it's pretty ingenious of her to suggest visiting Tokyo Tower for the larger crowd and better vantage point... while secretly wanting it for the A/C. Equally impressive is that a detail like the heat generated by Skullmeramon and Birdramon is mentioned, and that Izzy notices the distorted view of the tower it creates. Not as strong as the last two episodes, but still very good. I love seeing the DigiDestined all meet up with each other in a specified location in order to discuss plans of action, speculate about the eighth child and how to find him.her, and talk about the dangers of Myotismon possibly claiming both worlds after disposing of the eighth child. The address book gag was funny too, especially when everyone kept handing their's to Joe to the point he was sure Tai was about to do the same. I always enjoy seeing more of Sora and Mimi's friendship and I personally didn't find Mmi irritating or whiny here. Not only was her suggestion to go to Tokyo Tower brilliant, but I just loved how she pointed out that a guy wearing a large thick coat in the summer heat was not only unfashionable, but goes against common sense that even she doesn't lack. And this, of course, prompts SkullMeramon to finally ditch the coat and fight the Digidestined himself. An intense fight on top of a tower is just the action we needed for the middle of the arc, where things are gradually beginning to get more dangerous and desperate. It's the villains who shined here, though. Myotismon officially shows himself to be more heinous than any of the past villains by attacking random human beings, and in the typical seductive yet blood-sucking vampire way too. And this is only the start of how horrible he can get, folks! He's also got a new base in Odaiba - a tunnel in the ground underneath the TV Center. DemiDevimon and Gatomon's bickering continues to amuse, and Gatomon was great here. For the past few episodes, she's been portrayed as a completely cruel kitty, so her hesitation on attacking Kari, whom she is absolutely certain (and correct) is the eighth child, seems uncharacteristic for her and she recognizes it. What is it about this girl that throws her off her game? We'll find out soon, but all the same, seeing her sneaking up on Kari about to go in for the kill was a tense moment, as is the idea that she now knows where the eighth child lives and will inevitably come back for a second attempt on her life! Yikes!